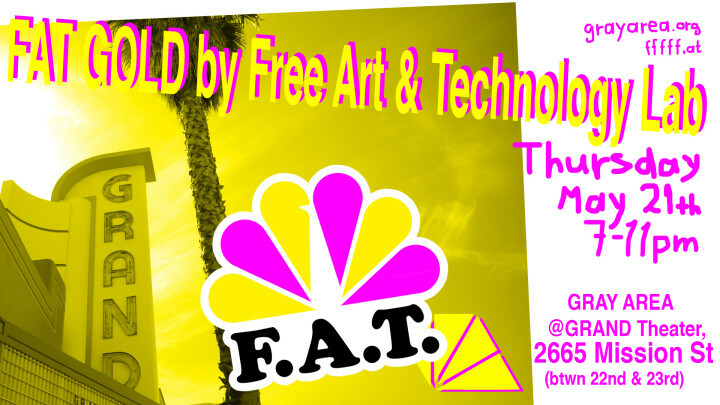 FAT Gold SF – Exhibition Opening this Thursday | F.A.T. The FAT GOLD exhibition opening at the Gray Area Grand Theatre is happening this Thursday! Come over an meet some of our OG FAT members from around the world. In attendance: Aram Bartholl, Becky Stern, Dan Moore, David Renault, Evan Roth, Golan Levin, Greg Leuch, Maddy Varner, Magnus Eriksson, Mathieu Tremblin, Randy Sarafan, Tobias Leingruber, Bennett Williamson and Zachary Liebermann. The exhibition is curated by Lindsay Howard and will be on display until May 31st.